Carmela Francisca Sacuj Matzar is a leader among Mayan women in San Andrés Semetabaj, a poor rural community in central Guatemala. 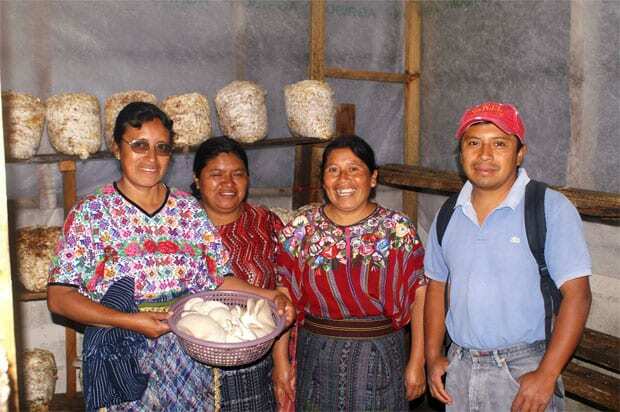 As the founder of Asociación Visión Maya Mujeres, a women’s association that produces textiles and cultivates mushrooms, Sacuj is helping 50 women to generate income and improve the lives of their families and their communities. Sacuj’s work ethic developed early. She began working at the age of 10 after her father died, leaving her mother to care for 10 children. The family supported itself primarily through subsistence farming, but their modest income was insufficient to pay school fees; Sacuj had to leave school after the seventh grade to work full-time to support her family. Sacuj founded Asociación Visión Maya Mujeres in 2004 to provide economic opportunities for women in her region. The association originally focused on the production of textiles, but Sacuj recognized that textile production was very common among women in her area. Determined to tap into a more lucrative market. Sacuj attended an intensive, one-week agricultural extension course at the local university. There she learned about the benefits of organic mushroom cultivation, including the burgeoning local and regional demand for Oyster mushrooms. Convinced of the potential market for this new product, Sacuj led the association to begin producing organic Oyster mushrooms in a back room of one of their homes, but their initial production volume and quality proved disappointing. The women were successful in securing funds to construct 10 small mushroom warehouses, but they lacked the technical skills and knowledge to maintain appropriate growing conditions. So the women reached out to TechnoServe for support. Since 2007, TechnoServe has helped them improve the volume and quality of the association’s mushrooms and linked them to more lucrative markets. This has resulted in a 100 percent increase in production and a 40 percent increase in net revenues. Currently, TechnoServe is helping the association to begin producing dried mushrooms, which command a much higher price than raw mushrooms. Once the 50 women producers have begun successfully marketing this new product line, TechnoServe will help them to leverage their new expertise to produce other dried products made from fruits supplied by local farmers. This will diversify the association’s income while also generating new income for the farmers. Sacuj’s success is a testament to the unlimited potential of female entrepreneurs to drive innovative new industries to transform the lives of the poor.